ChiIL Mama : Play Locally: A Double Dose of Shakespeare & Afro Beats! Play Locally: A Double Dose of Shakespeare & Afro Beats! Shakes your soul indeed! You could travel the globe and be hard pressed to find a resource as amazing as Chicago Shakespeare Theater. Check out our photos from Witches, Wizards, Spells and Elves-their recent family friendly partnership with Chicago chamber musicians. 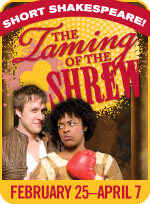 Taming of the Shrew opens today at Chicago Shakespeare Theater at 11am. We adore short Shakespeare and will have a full review for you soon. They're also currently playing A Midsummer Night's Dream, one of our favorites, and one of Shakespeare's plays most accessible and appealing to kids. Check in with ChiIL Mama this week for our tie ins with great kids' book versions, to read together before Shakespeare shows. We'll also have details up about our free family 4 pack ticket give away for Taming of the Shrew! In the mean time, check out Chicago Shakespeare's show page for fun activities, show shots, and more. Click here for our past Afro-Beats! coverage and full show details. If you've been excitedly counting down....today's the day. The show's a very affordable $10 and family friendly! Fulcrum Point New Music Project, the city’s leader in new art music and inventive collaborations between traditional music and popular culture, commemorates Black History Month with Afro-Beats! Fela, Monk, and the Roots of American Music in one performance only at the Harris Theater for Music and Dance, 205 E. Randolph Drive, Saturday, February 25, at 2 p.m. This performance is presented by the Harris Theater Family Series. All tickets for Afro-Beats! Fela, Monk, and the Roots of American Music are available for only $10. To purchase tickets, please visit www.harristheaterchicago.org or call 312-334-7777.